Today we remember the life and legacy of former First Lady Barbara Bush. She was a passionate advocate of literacy. 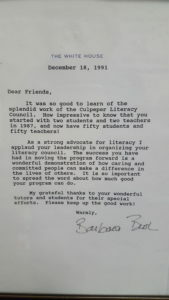 Culpeper Literacy Council received this letter from her in 1991.